Are you looking for a Reliable, Long Distance Mover to handle your relocation with no hassle? Moving Masters Inc. operates different than most moving companies for Long Distance moves. We offer a fixed price with guaranteed delivery dates. You will be assigned a Courteous & Experienced relocation team and a Clean, Fuel Efficient, Fully Equipped vehicle for the duration of your move. Our relocation specialist will be available from start to finish to ensure that you are experiencing a top-notch move. This means: NO guessing, NO hassle, NO surprises, and Total logistical control. For Direct Deliveries (Same day – Door to Door), the same team and vehicle that Disassembles, Packs, Wraps, and Loads your belongings, Drives them to you, Unloads and Reassembles everything, at a predetermined Fixed Price, or if time is needed, one of our own other fully qualified crews. No subcontractors. 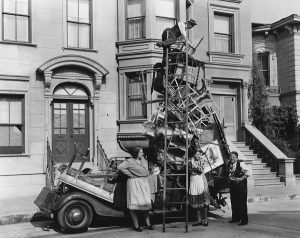 Most Van Lines/Brokers/Moving Companies will pick up your belongings and bring it to their base, unload it, warehouse it until Four (4) to Ten (10) other households are accumulated and going in your general direction. Then transfer it to a wholesaler who picks it up in a 50′ trailer going in that direction with his crew and their loads who do not have an exact delivery date. Due to transferring of your belongings, these companies lose control and this is where most of the problems lay. That is called the Common Carrier Service and what 90% of Movers Quote. For Today’s Promotion, Click Here To Call! Unlike many van lines or larger moving companies, our Distinctive, Individual approach means the same conscientious crew members will skillfully pack, mark, disassemble, wrap, stack, secure, unload, drive, deliver, and reassemble all of your particular belongings.This will result in a First-rate moving experience with the exceptional knowledge of who’s devoted to your belongings at all times! Moving Masters exclusively offers Full Service long distance relocation moves for those who prefer clean, reliable, private trucks with a professionally trained, honest team of careful movers. All at a flat rate; fixed price. We are a full-service Moving Company in New York.Moving Masters has three locations throughout New York. Our Movers in New York work to their fullest potential on every single job. Moving Out of State From New York? Moving state-to-state or across the country requires specific knowledge and experience that does not come with your average mover down the street. There is much more involved in making a move from New York to a different state than there is from Queens to Brooklyn. Our interstate movers have years of experience in moving families to and from New York to all over the US. If you’re Moving From New York to Florida, Texas, Georgia, North Carolina, South Carolina or anywhere in the US – we’ve got you covered. No matter where you’ve decided to move out of state, we can ensure the job gets done on-time, within budget and with proper care.